To be spectacularly unsuccessful; to fail so badly that it is impressive / astonishing / hilarious, evoking schadenfreude. In role-play games (such as Dungeons & Dragons) dice are used to add an element of chance, and some use what is know as the Criticals System, which adds the possibility of a character succeeding very will or failing very badly. A Critical Hit might do double damage to the enemy whereas a Critical Failure might mean you just shot yourself in the foot! Some Critical Systems were ridiculously complicated, with the possibility of knock-on effects causing a pretty minor action to accidentally wipe out your entire group. Players started to refer to these kind of knock-on effects as Epic Fails. Rolling a 1 where a character can ONLY fail on a 1. Rolling 1s multiple times in a row. *There are many different role-play games operating many different system so this won’t always be true. Heck, some RPGs don’t even use dice! 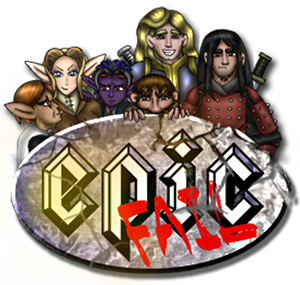 Epic Fail gained it’s popularity through an internet meme whereby users superimposed the words EPIC FAIL on various images showing spectacular failures. 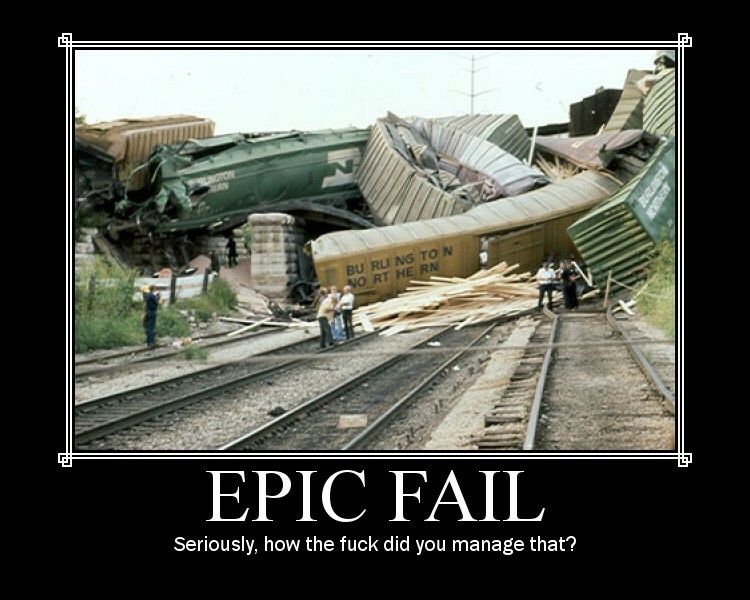 IMO this has to be the best Epic Fail ever! (Or should that be the worst?) I have never seen any to top it. If you have, seriously, send it to me, I want to see that!! 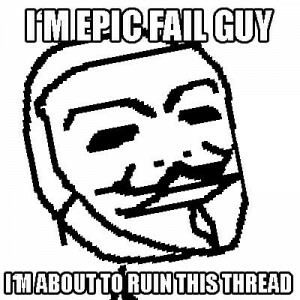 Epic Fail Guy (EFG) is a stick figure character created by Anonymous on 4Chan. He did not come into his own until, in one cartoon, he picked up a Guy Fawkes Mask similar to the one in V for Vendetta out of a bin. Thereafter he was always depicted wearing the mask and has become something of a figurehead for Anonymous. The meme involves Epic Fail Guy trying to do something, e.g. pressing the ‘WIN’ button, and failing. It’s open to interpretation and has produced many amusing threads and cartoons. And that’s the most complete explanation of Epic Fail that you’re going to get out of me, so quit asking!